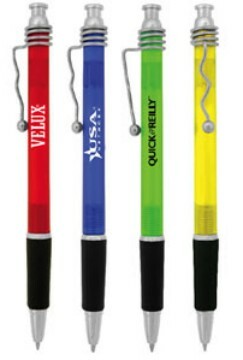 Personalized Twister Pens with Spiral Clips, CustomPrinted in Bulk. Promotional, Inexpensive. Wholesale personalized twister pens with fancy metal spiral pocket clip, comfort finger grip, click action and translucent barrel at a highly competitive price. We also supply blank (not imprinted) wholesale twister pens. Free artwork design. American clients pay no taxes. Canadian clients don't pay PST. We will send you a proof for your approval before production.